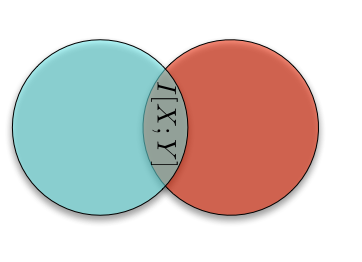 Venn1 diagrams are one of the first graphical heuristics we learn about in elementary (middle? high?) school. They're a convenient way to represent sets2, and allow for the easy visualization of set operations like intersection and union. Once we have sets, we can consider a measure3 on top of those sets, and we have ourselves the beginnings of measure theory. And thanks to our good friend Andrey Kolmogorov, we can then employ them in probability theory, which is really nothing but measure theory restricted to a space with measure 1.
and use that diagram to get out any quantity involving intersections and unions4. For example, the probability that \(A\) or \(B\) occurs is the probability \(P(A \cup B)\), which we see is just the 'area' of the union of the two sets. 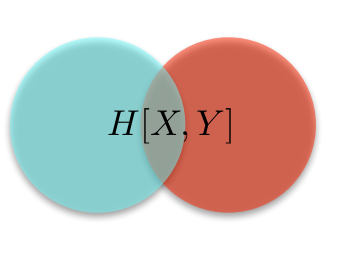 Similarly, the probability that \(A\) and \(B\) occur \(P(A \cap B)\) is the area of the intersection of \(A\) and \(B\), which we can get by computing \(P(A) + P(B) - P(A \cup B)\). 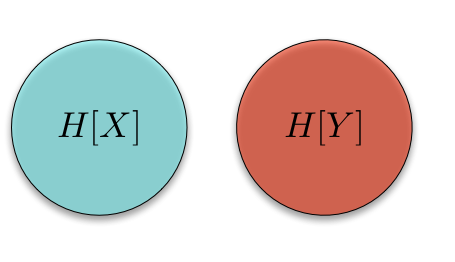 In words, this means that two events are independent if the probability of one occurring doesn't depend on the other occurring. This seems like a reasonable enough definition. But what about when two events are disjoint? Are they independent? since we assumed that \(P(A) > 0\). Thus, \(A\) is not independent of \(B\). In fact, they're as dependent as they could get: once we know that \(A\) happens, we know for sure that \(B\) did not happen. 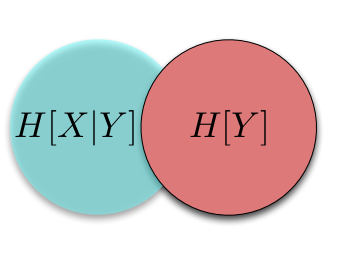 I found this result so striking that, at one point during a intermediate probability theory course, I wrote in my notebook, "There is no way to show independence with Venn diagrams!" It seems like we should be able to, but remember that Venn diagrams only allow us to show things about intersections and unions, not conditioning. and the second is defined in the obvious way9. These information diagrams are nothing new, and have found great success in explicating the properties of stochastic processes in general. Strangely, they only receive the briefest mention in most introductions to information theory11. Hopefully with time, these simple objects from our primary school days will permeate information theory and beyond.